A few years ago my family and I spent a week at Nehalem Bay National Park on the Oregon Coast. We camped in a Yurt for almost a week and participated in an Outdoor school with a great group of people/families through a home school group we belong to. There was a pioneer theme during the week where the kids learned great information about the pioneers as well as made pioneer crafts and played pioneer/old fashioned games. There was also a daily chapel service where we took a look into the full armor of God. It was a great time all around! There was also a reoccurring theme through the week about grace, God’s grace and during that week as well as when I drove the family home, my mind drifted back to my personal journey of grace – the testimony of how I gratefully came to know Jesus Christ as my savior just two months after I graduated from High School when I was 19 years old. Everyone who has come to faith has their own story and in this post I wanted to share a brief glimpse into my journey of Grace, or rather my Journey toward God’s Amazing Grace. I’m hoping that something in this post will be of encouragement to you in your own journey right now as God can heal all your wounds as well – if you’ll allow Him in to do so. I also hope that for those who know or are getting to know me that this will help you get to know me a little better as well. My journey began when I was a young child. I was first introduced to the things of God, who Jesus is, etc in the kindergarten and Sunday school at the church my family attended at the time. I remember those times very fondly as I enjoyed the lessons and music but did not truly know what I needed to do to really receive salvation and know God personally. When I was just about six year old, my world seemingly came to a crashing halt as my siblings and I learned that my parents were getting divorced. I remember how confusing this was at that age because I had no Idea what this meant and at that time period it wasn’t very common but none-the-less it was happening and through the events of that divorce and the following years it began to shape who I am today. Once the divorce was in process my mom received custody of my siblings and I. Then unfortunately due to different family issues we were kicked out of the home my parents were renting from family members and at the time my mom as I recall was only working part-time and some how God saw us through. About a year or so later, my mom remarried and life became a bit more stable for my siblings and I although relationships were strained at times as we all adjusted into a blended family. Visitations began with my biological dad about every-other-weekend and then after time it was once a month, and then from about 10 on it was a rare occurrence at all. A few years after he and my mom divorced he remarried and started a new family and they had 4 children of their own. Looking back now as an adult, after the visitations stopped it’s clear that not having my dad in my life took a toll on me because of his absence but also because of the emotional and physical scars that were created over the years from an early age on - which I will not go into detail here. I remember asking my mom many times as I grew up, “why doesn’t dad love me?” and she’d always, being a good mom that she is, say, “your dad loves you” but even though she said it, by his actions I knew it wasn’t so - even to this day. As a side note: I tried to have a relationship with my biological dad at various times over the years but it was clear each time that relationships cannot survive on a one-way effort and unfortunately he eventually told my siblings and I at one point to just move on with our lives. So it has seemed that we not only lost our dad but our siblings as well because we couldn’t fully have a relationship with them, (although I’ve always wanted to) because he wanted us to move on. I’m not sure what my siblings have been thinking over the years or what they’ve been told but, I can say that we, (my older brother and sister and I) never abandoned them and up to my early twenties, I made efforts to have relationships with them. I still have hope that one day, they will make efforts themselves as adults, if they want to, so we can have a relationship again. This additional loss has been hard because I’ve always wanted to have a good relationship with them, because I do love them, but life apparently doesn’t work out as we expect sometimes despite our efforts. When I was in Jr. High I was invited to attend church with a friend and for a while I did but even then I thought I was a Christian and that was because I thought by being “a good person” and doing “good” things that I would go to heaven because of what I had done and I’d learn later that this wasn’t the case. I grew up with very low self esteem and I didn’t feel very worthy of love or friendship and as a matter of fact, I really didn’t know what love, true unconditional love was. I grew up feeling inferior a lot and I still struggle at times today with these same things and don’t process rejection very well either due to my life experiences although as an adult I’ve grown a lot in this area with God’s Help! I also bottled a lot of things up inside back then and didn’t share my thoughts, struggles, or feelings with anyone, which wasn’t and isn’t a wise thing to do. Why? Because it just made and makes things worse for me because of a long time battle with depression. Because of these things I probably made some mistakes in relationships, I think I had ruined some because of the “baggage” I was carrying around and still regret those things very much! Many that knew me back then, through Jr. High and High School never knew that I struggled with depression, low self-esteem or anything because I became very skillful at masking what was really happening inside me. I felt empty, hopeless and internally was in despair and my depression became so bad at one point during High School that I started thinking about and planning on how to end my life on many occasions. I actually went as far as starting to go forward with the plans but each time something, (I’d learn later on that it wasn’t a something but literally a Someone) stopped me from doing such a foolish thing! During this time of depression I quietly started seeing the school physiologist and it was then that my mom learned about my struggle because they called her. Everyone cared about was going on but unfortunately I didn’t fully come out of this darkness which largely I believe was influenced by my biological dads rejection of myself and my siblings. It also had to do with my own thoughts and skewed self-image and self-worth as well so I owned a lot of the darkness I went through because of my own destructive thoughts and actions. During the remaining years of high school things started to change for me as I began to have a longing in my life that nothing or no one could satisfy. Then towards the end of my Jr. Year in high school I began to work at a Ross Dress for Less store. It was there that God brought some new friends into my life and one in particular started sharing with me about the things of God. I began to attend church with him from time to time and he continued to share truths about the scriptures. Then my friend invited me out one night to grab a bite to eat and to further share with me about faith in Christ. I was nervous for some reason, maybe because I already thought I was a Christian, but it turned out to be a night that changed everything for me because I began a new life that summer night in August of 1989. At one point that evening as we ate dinner at a Shari’s restaurant in Beaverton, Oregon, my friend shared with me simply about how God loved me and sent is son Jesus Christ to die in my place as the ultimate sacrifice for my sin and that if I repented, (repentance simply means to confess and turned away from your sin) that He would forgive me and that I would then be able to have a personal relationship with the Lord. He drew out a line diagram on a napkin that explained all of this in a few short minutes with verses. As he came to the end of what he shared it was like a “light bulb” went on in my head because everything just clicked and I knew at that moment what he shared was true – the answer to my hearts longing. He asked me if I would like to receive Christ myself and I said yes! Then we prayed and from that night on I began an adventure of faith which completed my initial Journey (As God had been drawing me to Himself all along) to or of faith as I received His salvation through faith and by His Grace and there was nothing I could do to earn salvation or a way to heaven myself! Flash forward to today, I’ve been through a lot even in my Christian walk but I’m still walking in this new adventure and journey and growing in grace, truth, and understanding and learning more and more how amazing God’s grace and love is! I’m no longer trying to perform a certain way to earn favor with God and I certainly try not to do it with people either because with God, I know He will always love me and will never forsake me unlike how people have done in the past. (See Hebrews 13:5) I already have His favor because of what Christ did, (He sacrificed Himself for all mankind) and continues to do in my life, (Helps me grow through His Holy Spirit’s Guidance and He intercedes for me to the Father) and furthermore I know He’s my heavenly Father and that ministers to me a lot because He said in His Word that I’m adopted as His son and I’ll be a part of His family forever and “you can take that to the bank!” as they say! I’m so thankful that through all the past circumstances, depression, suicidal tendencies, etc, that I’m here today to experience all the joys and pains of life because each day is a new opportunity to learn and grow more than the day before as I can learn from each circumstance and ultimately I can hopefully bring more Glory to God! Yes, all those things have shaped me, for better or worse, into who I am today but God has the final word on my life and is continually shaping and molding me into who He wants me to become as His child as He helps me grow still more in the grace and knowledge of Him! Another great thing I’ve discovered about my life with God is that I can now see, rather, I’m learning to see myself through God’s eyes. I now can see my worth through who I am in Christ instead of basing all of these things on mine or the world’s skewed/imperfect point-of-view. Now, even in the craziness of life I can also experience the true peace that comes from God and I can, just as I did in August of 1989, walk in newness of life with a greater purpose and plan for everything that I’ll do going forward. His Grace is sufficient and His Grace is amazing! What about your journey? 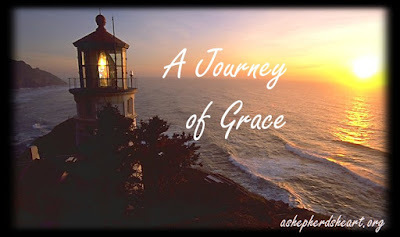 Maybe you can share your Journey of Grace by leaving a comment on this post for others to see and be encouraged by!? If you’d like to explore faith yourself, here are some links that you should check out. Or feel free to contact me as well via the e-Mail address in my "About Page"
It is inspiring to my faith to see how the Lord uses us who feel our life has no use at all. He is "Mighty to Save" and He knew your tender heart though broken by the ones your heart trusted would be mended by His touch and used to shepherd His flock. He has showed you the path of life He has for you, Psalm 16:11. You listened, obeyed and trusted Him and I believe you can expect Him to show you even greater and mightier things He has for your life going forward. Thanks for sharing. Thanks for sharing your testimony. It is great to hear how Jesus has moved in your life and it is fantastic that you are stepping out boldly to share what the Lord has done. Keep pressing in and see where the journey goes next! Randy, thanks for your story of your life with Christ. It is always good to hear how a another believer came to know Christ as the King of their life. Thanks for sharing this verse! "You will make known to me the path of life; In Your presence is fullness of joy; In Your right hand there are pleasures forever. " I am serving Him wherever He has me know and I am waiting expectantly to see where He leads next in using me how He see fit. God Bless you! I'm humbled by your words of encouragement. Thanks for your encouragement! Glad to know that God has moved in your life as well! Thanks for comments. How did you come to know the Lord? It is encouraging to learn this about another believer and I would to hear about your journey.